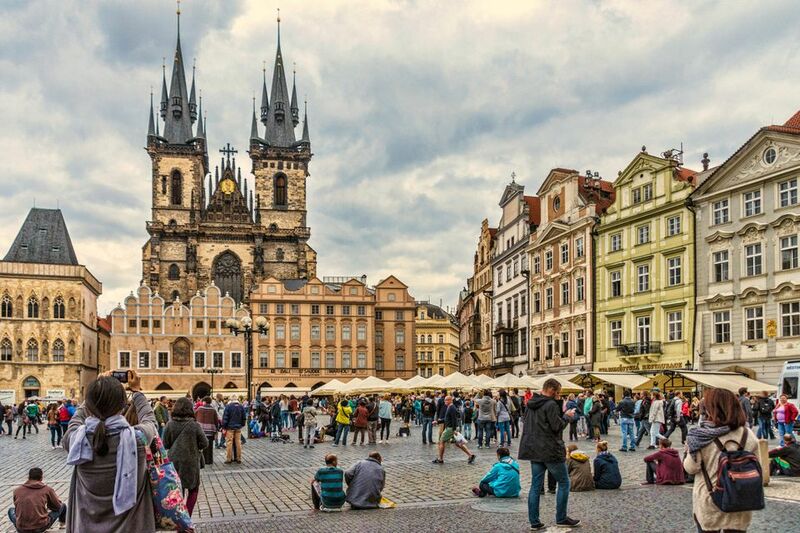 If you're doing the whirlwind tour of Prague, you may want to eat on the run instead of sitting down to a meal at a restaurant, which, in the European way, will typically take an hour or two of your time. Street food in Prague may not appeal to everyone, but it is available if need a quick snack before heading off to Prague Castle or exploring Old Town. Try these options for street food if you're in a hurry or on a budget. And, you may find yourself hooked and want to re-create these street dishes when you return home. These fluffy, hot, sugar-sprinkled pastries are baked before your eyes and sold fresh all over Prague. Look for the sign that depicts a trdelnik pastry—you'll find them in Old Town, Mala Strana, and elsewhere in Prague. This street food is perfect if you have a sweet tooth. The pastries are not unique to the Czech Republic. The former Austro-Hungarian Empire was home to many modern Central European countries, including the Czech Republic and Slovakia, and the recipes for trdelnik pastries were passed from family to family, and town to town. Mulled wine is a favorite cold-weather drink. Usually made from red wine, mulling spices are used to deepen the flavor of the wine and sugar or honey sweetens the drink. You can order mulled wine at restaurants and bars, but during cold weather, you'll be able to buy a mug of mulled wine from vendors. The restaurants on Old Town Square sometimes set up mulled wine stands to attract shivering patrons. It is customary for tourists to sip and enjoy mulled wine at Prague's Christmas market while browsing for souvenirs and gifts. You may want to start a new holiday tradition and serve mulled wine at home. One way to do it is with apple cider, red wine (like Cabernet), honey, cinnamon sticks, citrus zest, juice, cloves, and star anise. Sausage carts on Wenceslas Square do a steady business of feeding those on the go throughout the day. Sides include a hunk of brown bread and sauerkraut. Hot, filling, and easy to take with you, sausages, with a dollop of spicy mustard, are a favorite Prague street food. You can find a variety of sausages. The German white sausages and Polish red sausages are the most common. Pair your sausage with a plastic glass full of premium Czech beer. Interestingly, St. Wenceslas is also known as the Sausage King and is considered the patron saint of the klobása sausage. The fried cheese ​sandwiches (smažený sýr) available from Wenceslas Square vendors look like a fried chicken or fish patty. The thick slices of cheese are breaded, fried, and topped with mayo (or tartar sauce) before being sandwiched into a thick bun. Once you return home, you may yearn for this dish. You make it by dredging a square of cheese like Edam or Gouda in flour, then dip it in egg, and then in breadcrumbs, and then in flour once again. Fry the cheese in a shallow pan with hot oil for two to three minutes per side. Where Is the Sephora Store in Prague?